In the standard variant – Audi pre sense basic – the system analyzes the information from the ESP sensors. When they signal maximum brake application or skidding, the control unit intervenes. Depending on the situation, it activates the hazard warning lights and begins closing the side windows and the sunroof; it also tensions pneumatic springs and the belts at the front seats. This tensioning process, which is reversible, is triggered by small electric motors. If an accident does not occur, the belts are released again. The expanded levels of the new safety system are called Audi pre sense front, Audi pre sense rear, and Audi pre sense plus. They work closely together with the driver assistance systems adaptive cruise control with stop & go function and Audi side assist. 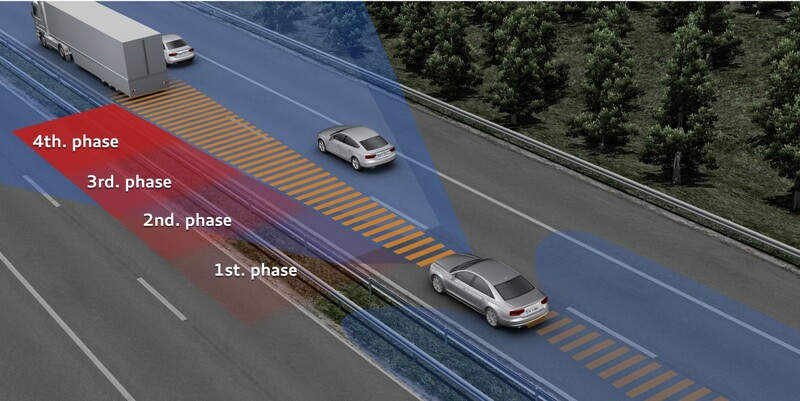 Audi pre sense front monitors the traffic in front of the vehicle for potential collision hazards. The system provides multiple levels of driver support. The first is a warning signal, and the second a warning jerk caused by brief braking. If the driver now simply places his or her foot on the brake, the brake assist initiates deceleration. Even an avoidance maneuver – often the better solution – would still be possible at this time. Should the driver remain passive, the third stage follows – partial braking. The vehicle is slowed with roughly one-third of the possible pedal force. The windows and sunroof begin to close, and the hazard warning lights are activated. The seat belt is also tensioned in this case. 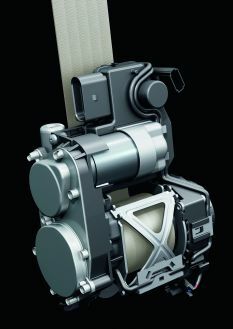 If the full version of Audi pre sense plus is on board, a fourth stage comes into play: first another round of partial braking, but now at a moderate level, followed by maximum braking, during which the belts are pulled fully taut. This occurs about half a second before impact, at which point a collision can no longer be avoided. Audi pre sense plus helps to reduce the vehicle’s speed by up to 40 km/h (24.85 mph) before the crash and thus to mitigate the consequences of the accident. The Audi pre sense rear system uses the Audi side assist sensors and mitigates the consequences of a rear-end collision. Here, too, it closes the windows and sunroof and tensions the seat belts. If the optional front memory seats are on board, they move into a better position for the passengers.